Investors were spooked through most of October. At one point, the year’s market gains were entirely erased. Now, despite signals of recovery, a degree of caution is to be expected. The darling FAANG stocks took it especially hard last month. Amazon (Nasdaq: AMZN) had almost $120 billion wiped off its trillion-dollar market cap in a matter of days. And shares in Google parent company Alphabet (Nasdaq: GOOG) fell sharply after a mixed third quarter earnings report. Even a rosy third quarter earnings report couldn’t protect Netflix (Nasdaq: NFLX) from the bloodletting. The media company saw a 30% drop in share price over two weeks before starting to recover. General volatility and net declines have a lot of people worried that other people aren’t worried enough... which raises the question: Are we headed for a lasting downturn, or was a trick-or-treating bull merely wearing a bear costume? Historical analysis suggests that October’s sell-off created more of a buying opportunity than a cause for concern. This week’s chart shows the top 10 draw-downs in the S&P 500 over the last 65 years... one of which we just experienced. After hitting its peak on September 20, the S&P 500 fell 7.8% over the following 35 days. 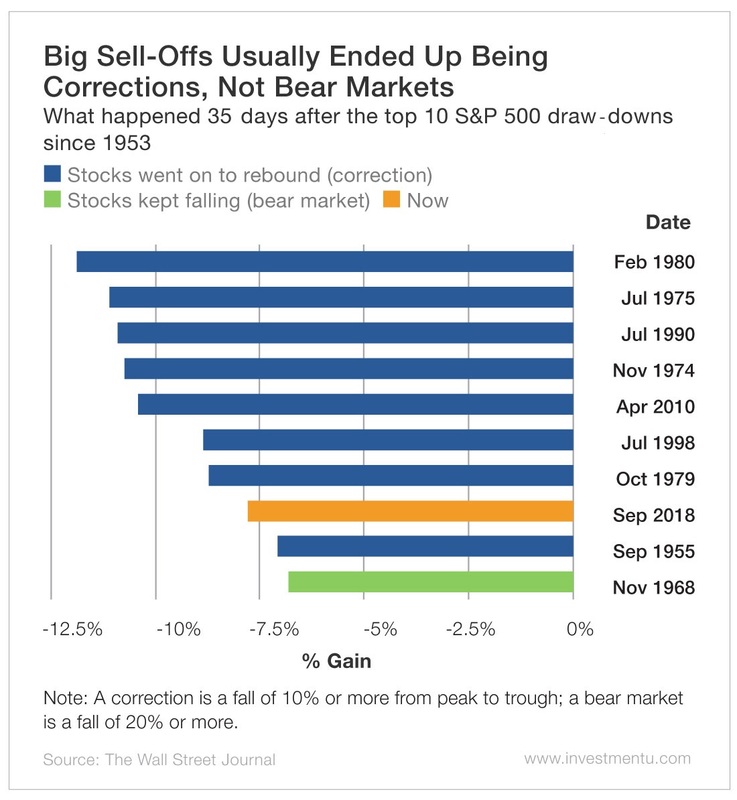 By contrast, bear markets don’t usually come with much foreshadowing. For instance, the 2007 sell-off that ushered in the global financial crisis started with a mere 5% fall, which doesn’t even crack the top 10 draw-downs list. Nonetheless, when October’s dust settled, the S&P had lost $1.9 trillion... making it the worst loss the index has experienced since September 2011. October has a reputation for being a notoriously volatile month. But it’s important to keep the reeling market in perspective. There were eight trading days last month where the S&P closed either up or down by a full percent or more, bringing the year’s total to 44. The average is 50 per year, according to analysis by Plante Moran Financial Advisors... so October put us on track for a perfectly normal year. That report also points out that equity markets undergo an annual 10% market correction more often than not. And despite intrayear volatility, three-quarters of the time, a correction leads to new, annual highs. The current bull market cycle will eventually turn. It’s inevitable. But indications still point to a strong fourth quarter... even if there are a couple bumps in the road. So if you’re in the market for the long haul, a correction shouldn’t mean anything to you other than a buying opportunity. After all, one man’s trailing stops are another man’s bargain.